A made for TV sequel to 2010’s Tangled, the story continues via 2017’s Tangled: Before Ever After. Set six months after the original film’s events, we follow what happens after long-lost Princess Rapunzel (voiced by Mandy Moore) returns to her family in the kingdom of Corona. Rapunzel deals with a mix of pressures, mainly from the men in her life. Her father King Frederic (Clancy Brown) overprotect her, and her boyfriend Eugene (Zachary Levi) pushes her to get married. All that and her recently-shorn magical hair grows back, too! In the face of all this, Rapunzel feels smothered, so she needs to figure out how to deal with her desire for independence. I admit that I didn’t feel wild about the original Tangled, as I thought it offered Disney on cruise control. The movie took themes and character ideas we’d seen in many earlier efforts and failed to give them much of a creative spin. I thought Tangled offered moderate entertainment but not more than that. I wish I could claim that Before improves on its predecessor, but alas, the tale fails to do much to stand out on its own. Part of the problem comes from its basic conceit, as Before acts as a “midquel”. That’s because Disney already provided a release that gave us a brief sequel. A short that ran theatrically prior to the 3D Beauty and the Beast, Tangled Ever After showed the wedding of Rapunzel and Eugene, so Before develops their relationship between Tangled and Ever After. It does so in an incomplete manner, as fans will find further adventures via a Disney Channel Tangled series. That series’ existence makes Before feel more like a pilot than a full-fledged movie, as it ends on a less than conclusive note. Clearly it exists to launch the series, so it fails to stand alone especially well. I wouldn’t mind this aspect of Before as much if the story itself boasted much inspiration. Unfortunately, it remains as derivative as the theatrical movie but without as much wit and charm. I’m glad the original actors return for Before, and the film even adds talents like Julie Bowen and Clancy Brown. Apparently these performers will continue onto the TV series, and their presence gives Before more class than otherwise might be the case. They’re left with a forgettable tale, though, as Before just brings us more of a princess with wanderlust. That already acted as the theme of Tangled, and this basic plot point seems especially contrived here. It seems clear that Rapunzel feels held down by her royal life solely to motivate stories to be told during the TV series. Before sets up the notion that she’ll experience new adventures, and it often appears to have no purpose other than as a launching pad. In a way, the theme makes Rapunzel a little unlikable. The girl spends her entire life trapped in a remote tower - now she enjoys all the trappings of royal life along with a family and boyfriend who adore he, and she’s unhappy? Does this really make a lot of sense? Maybe the concept would play better if Before explored the theme in a more involved manner – ie, if it made it look like Rapunzel traded one “prison” for another. But Before doesn’t do that, so Rapunzel just seems whiny. This isn’t a good characteristic for the lead, and it creates a hole at the center of the movie. Even without these concerns, Before Ever After would remain mediocre just because it lacks much real purpose. The movie exists mainly as TV product and it never creates its own personality. 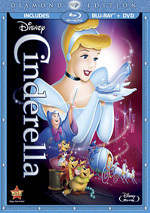 Tangled: Before Ever After appears in an aspect ratio of approximately 1.78:1 on this single-sided, double-layered DVD; the image has been enhanced for 16X9 televisions. For SD-DVD, this became a good presentation. Within the format’s constraints, sharpness seemed positive. Any softness came from the limitations of DVD’s resolution, so the majority of the film offered nice clarity and accuracy. I saw no shimmering or jaggies, and both edge haloes and print flaws remained absent. In terms of palette, Before opted for a semi-pastel look that came across well, so the hues looked pretty vivid and bold. Blacks were fairly dark and dense, while low-light shots demonstrated nice clarity. This turned into a largely appealing image. I also felt pleased with the film’s Dolby Digital 5.1 soundtrack, as it added a little pizzazz to the proceedings. The movie offered enough action beats to give the soundscape some zing, and those used the five speakers in a reasonably lively manner. Music showed good stereo presence, and quieter scenes offered a nice sense of place. Add to that some localized dialogue and the soundfield worked pretty well. Audio quality followed suit, with music that appeared rich and lush. Effects offered accurate information, with impressive low-end at times, and dialogue appeared natural and concise. While not a killer soundtrack, the mix seemed more than satisfactory. We get four Short Cuts. These offer Tangled animated shorts, and we find “Checkmate” (2:32), “Prison Bake” (2:22), “Make Me Smile” (2:32) and “Hare Peace” (2:27). All four boast surprisingly strong entertainment value – indeed, they’re more fun than the main film. The disc opens with an ad for DisneyNature: Born in China. Sneak Peeks adds promos for Elena of Avalor and Descendants 2. 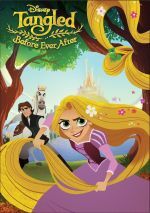 Tangled: Before Ever After exists to launch a new TV series, and that lack of organic purpose becomes a problem. While not a terrible film, it fails to deliver much creativity or charm. The DVD presents pretty good picture and audio along with minor bonus materials. This becomes a forgettable piece of animated product.